*Only two of them are actually new makes. The other two are previously sewn tops with a few changes. I'm collecting them all in one blog post simply because they are the last four things to come off my sewing machine and I took pictures of them the other day. I actually worked on all of them at the same time and then finished them all in one weekend. Nothing makes you feel more accomplished than finishing four things in one weekend! 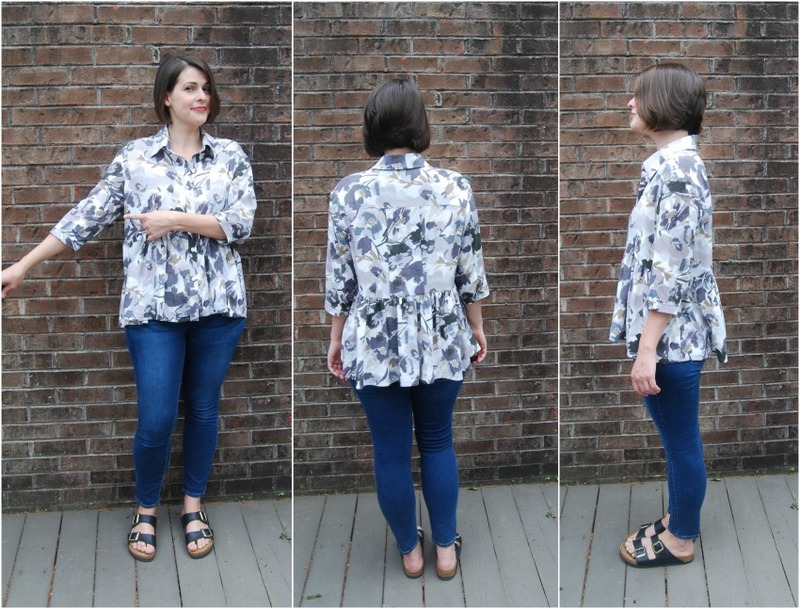 Anyway, the first top is my grey floral Burdastyle shirt that I recently blogged about here. I went back to the fabric store and bought another yard of this rayon to do 3/4 length sleeves like my other version. And I like it so much better. 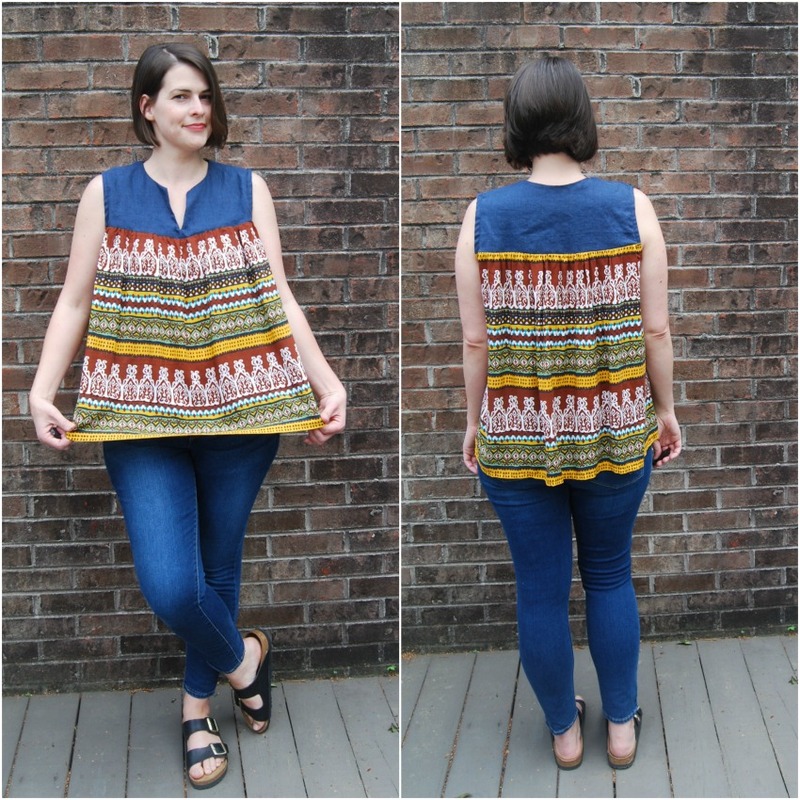 I was able to wear it once on a cool day a week or so ago, but this top will go in the closet until fall. Too hot for longer sleeves already. I painstakingly unpicked the armhole seams- stitched twice and then serged! I'm always so thorough on seams I need to undo. Looks better with longer sleeves, doesn't it? I think it does. 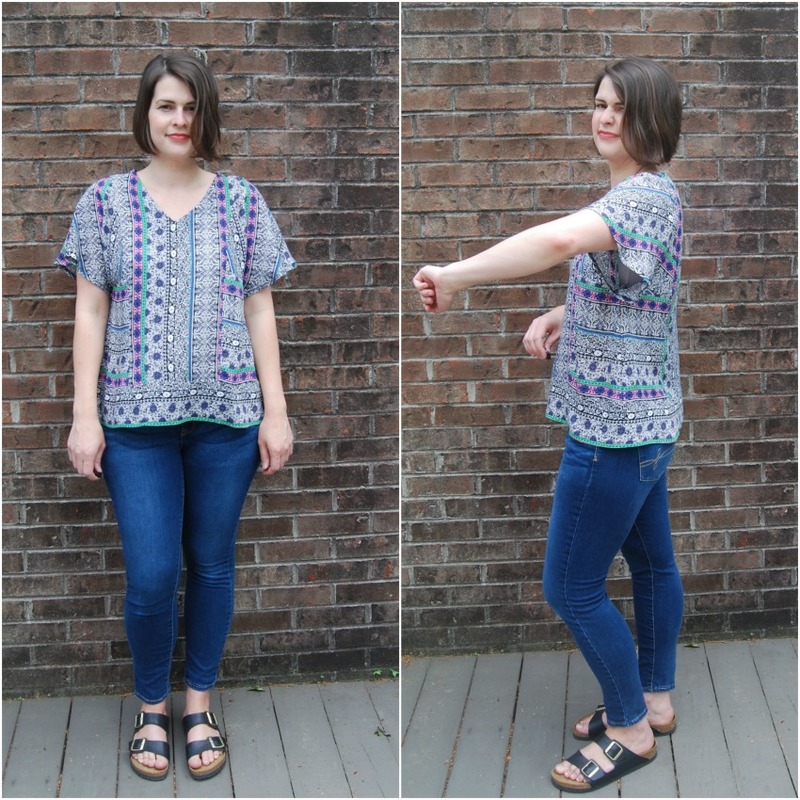 I get a more billowy, bohemian vibe instead of a granny chic vibe with the shorter sleeves. My next alteration was to this rayon challis and linen McCalls 7095 top I made last summer. I never wore it. Not once. The elastic waist was too bulky. I think there was just too much volume gathered in to the elastic waist. So I unpicked the channel the elastic was sewn in to- again, painstakingly, because it was several rows of stitching. And then I chopped it shorter and hemmed it. Unfortunately, I hemmed it too short the first time around. So I then unpicked the hem and sewed a strip of fabric on the bottom to make it longer. Can you tell I'm missing a stripe in there? It was definitely a dedicated remake. But I am so glad I persevered and fixed it because I have worn this top multiple times already. It will be a staple this summer. The next top is a new make. I made this as a wearable muslin. I bought McCalls 7361 without any real intention of making it right away, but then I noticed the striped version on the pattern envelope. I had this super cheap rayon challis in stash that I figured would be perfect. It was not fun to cut, however. I starched the hell out of it to keep the stripe as straight as possible. I think I did an ok job. Pattern Description: McCalls 7361, a loose fitting, pullover top with neck and hemline variations. There is some very interesting seaming in this pattern. I made view D, the striped version, but with the v-neck. The sleeves are cut on the bias. Pattern Sizing: 6-22. I cut a 12 to try and reduce some of the width even though I normally cut a 14. Alterations/Deviations: The finished top was so, so short. In an attempt to save it, I added a strip of fabric to hem. I actually kind of like the added band around the hem. We'll just pretend it was a design feature. So pay attention to the length if you are making this. I also had to straighten the shoulder seam after the fact. I should just do a square shoulder adjustment all the time now, no questions asked. I straightened the shoulder seam from shoulder point to neckline. I probably took a 3/4" wedge out. Not the proper way to do it but it helped. I'll do a proper square shoulder adjustment next time around. Likes/Dislikes: I like the shape. I like all the interesting seaming with the stripe. I do not like how low the armholes are. You can see straight to my bra. I'll wear a camisole under this one but maybe I'll try and raise the armholes a bit next time. Can you do that with a cut on sleeve? I figure I'll just redraw that underarm curve up a little higher. Conclusion: It's funky little top pattern. I would like to make it again with all the changes I listed above. I'm even kind of interested in the pleated side panels. The last top was super quick and is probably my favorite of the bunch. 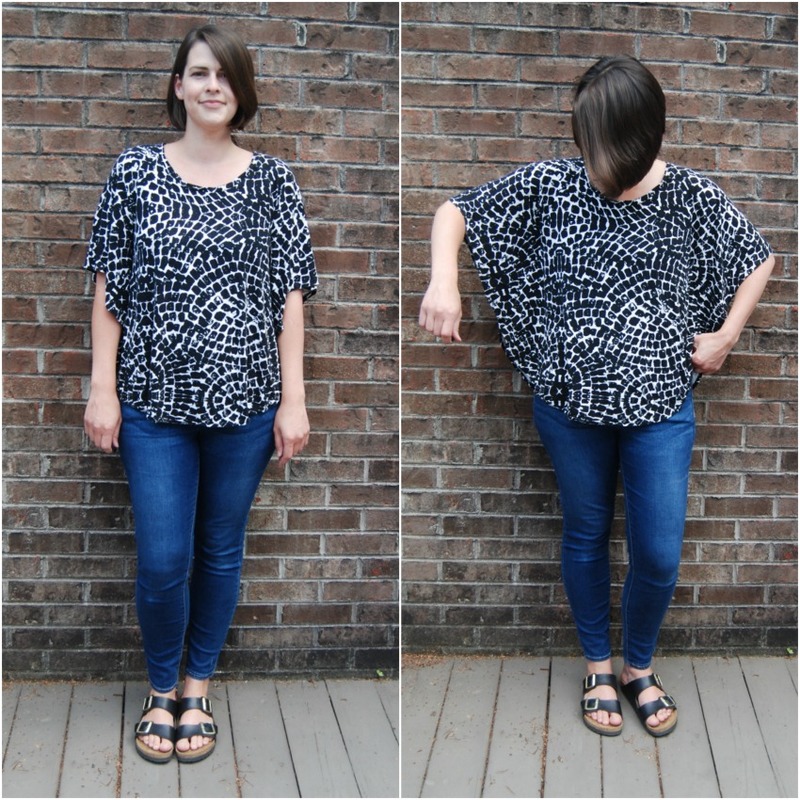 Pattern Description: Kwik Sew 3891, batwing top with curved hemline and raglan sleeves. I think this pattern has been around for a long time. This is the first Kwik Sew pattern I've ever sewn. I bought a few at Hancock the other day on deep discount. I made view A but with the scoop neckline. Pattern Sizing: XS-XL. I made a S with the length of a M. I'd say generous sizing in this pattern. Not that sizing is super important. As long as the neckline sits where you want it to, you're good to go with this style of top. Fabric Used: A Nicole Miller rayon jersey from Joann's. I bought a few yards a while back but this is the first I've sewn up. It's nice stuff. Nice medium-ish weight but still pretty drape-y. I think it was perfect for this top. I have worn this top many, many, many times since making it. And I have to report that the print has faded. I'm on about the 12th wash or so and it's just now fading. It didn't fade at first so I was pretty excited about the quality. Alterations/Deviations: None, other than using a longer length. I also did my own neckband length. I always cut a neckband strip and then figure out the length as I'm sewing it on. I don't trust the length given in patterns because I think it always varies depending upon your fabric. Likes/Dislikes: Love everything about this top. I love the way the raglan seams are sewn together to make the sleeves. I like the wide scoop neckline. The length is good. It's so easy to wear. I will take more care with my hem next time. I probably should have used some fusible to stabilize first. Conclusion: I will definitely make this again. I have worn this one so much already that people might wonder if it's all I own. 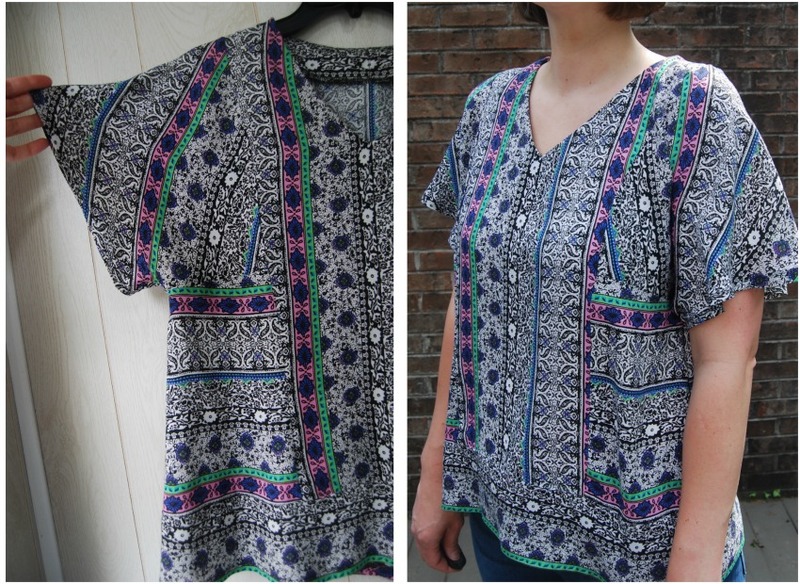 It's a great, super quick sew. Man, that is a productive weekend! I was curious about M7361, it looks fun. And I think you'll be able to raise that underarm seam without too much trouble, considering all you've been tweaking these days! Inspiring amount of perseverance on saving the first two. I have a couple of dresses to alter (let out, really), and just haven't made the effort. I don't mind unpicking, but making new is obviously more appealing! And top #4, I can see what you love about it. Nice print, too, bummer about the fading. All the tops look great. Altering seems such a pain and I put it off, but as you say it's definiteły worth it. The one with the blue top/patterned bottom looks like a great summer staple. Also, so pleased you highlighted the Kwik Sew pattern. Honestly I do not like the fit of their patterns on me usually and I had given up looking at them, but years ago my daughter had this style of top and has been wanting another one. Have been unable to find a pattern until now! Good for you for fixing those first two - that's dedication and they both look great!! Of the new two - the second one is my favourite. I think it's very you. You can never have too many tops and these all look awesome, my fave is the last one too! It is a great feeling to fix up those things that 'aren't quite right' - I have quite a few of those! Great makes! I love that you re-worked some previous makes to improve them. I should do that to a bunch of my stuff. I really like the one with the low armholes - that fabric is gorgeous, and really shows off the interesting cut of that blouse. I definitely think you could raise the armholes on the next version, like you said, just start the armhole higher on the body of the blouse, maybe using a well fitting tank as a guide. 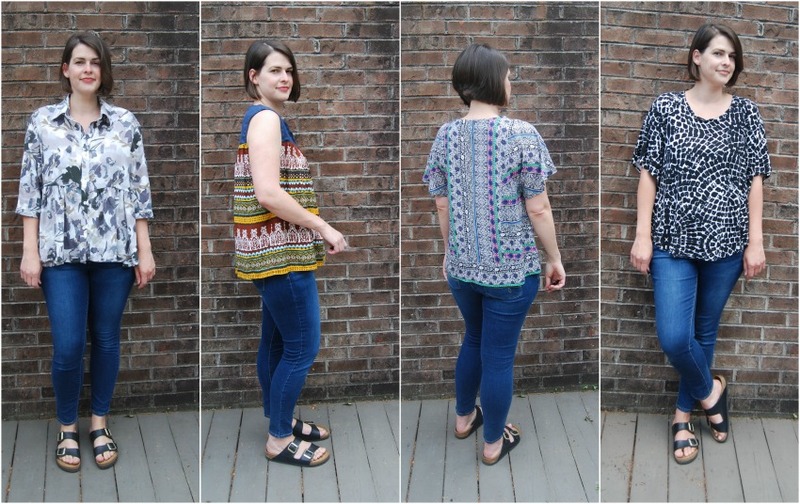 These are all lovely summer tops! these are all great tops for summer, I especially like the last one. this year I'm trying to investigate new shapes but am so timid. these all look good on you. Particularly the Kwik Sew pattern - I would not have given that a 2nd look but it is really pretty. The longer sleeves definitely improve the vibe of the first top but the last one is my favourite. Simple but really lovely in that fabric.